Jalan Besar Stadium, Friday, June 18, 2011 – Nine Minutes. That’s how long the Singapore U-15 boys needed to turn a 3-1 deficit into a 4-3 victory at the 23rd Lion City Cup. Newcastle led 2-1 at half time and when they scored their third goal to lead 3-1, it looked like game over. However, our local boys, clad in blue, scored twice in stoppage time to delight the strong, vocal and provocative home supporters. 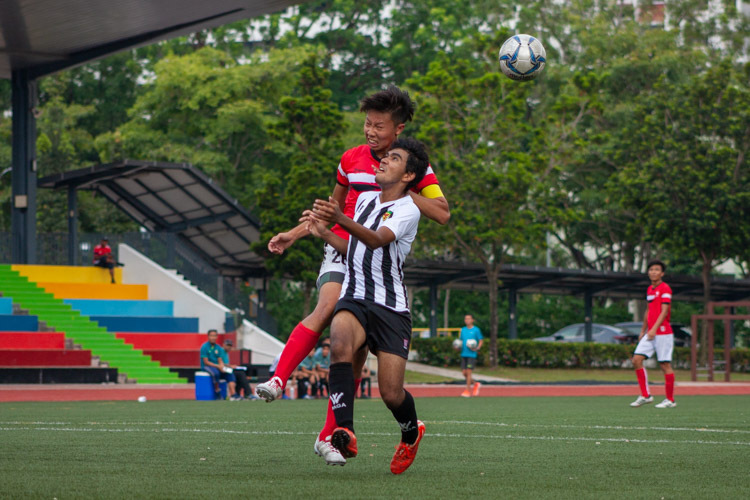 Newcastle took the lead as early as the fourth minute and although Singapore equalized soon after, Newcastle made the most of their few chances to go up 3-1 just after the hour mark. However, the national U-15 side showed their character and determination to grab all three points in the end. “We are not surprised with the performance of the boys. As long as they play to their ability, they will do very well,” said Glusevic Dejan, coach of the Cubs. 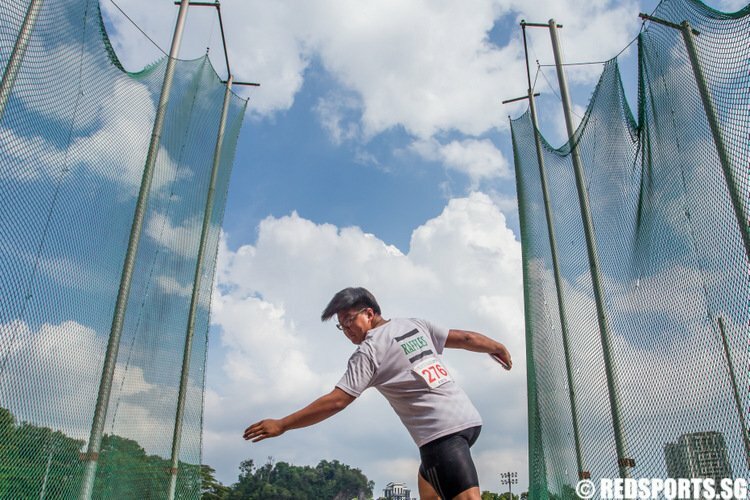 It was a jittery start by the Singapore boys though. 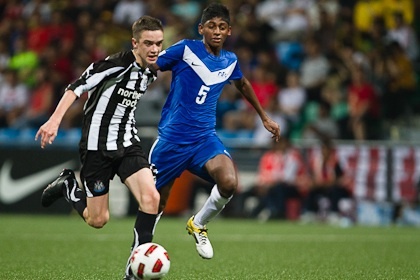 Although they showed that they were not afraid to get physical, it was clear that Newcastle were a handful for Aaravin’s (Singapore U15 #5) defense, as he admitted later after the match. 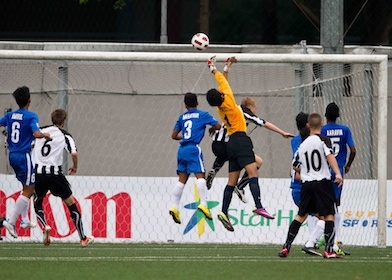 True enough, a harmless looking corner into the six yard box was fluffed by goalkeeper Heirul Suhanes (Singapore U15 #1) and James Atkinson (Newcastle U15 #6) scored the first goal of the match following a goal mouth scramble. 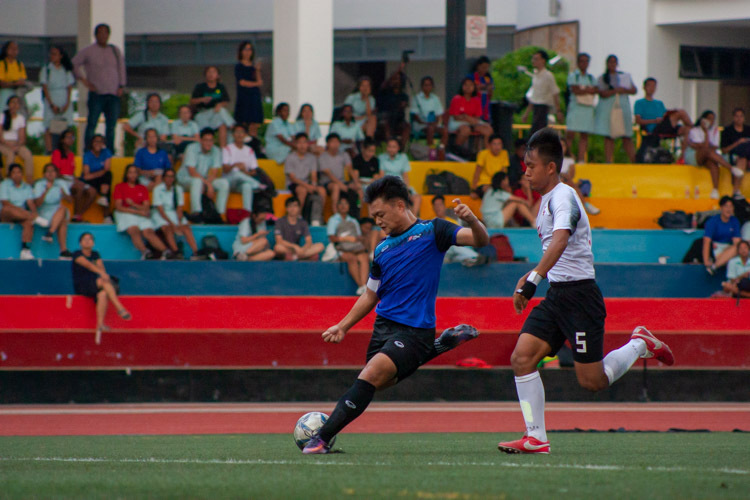 A lesser team would have folded but the Singapore boys remained calm and came up with an equalizer nine minutes later. 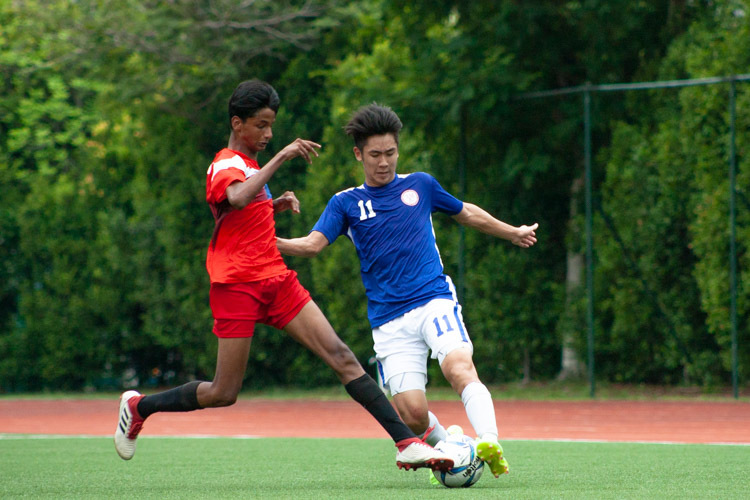 A counter-attack by the home side was directed to Zulfadhmi Suzliman (Singapore U15 #7) on the right flank. Realizing that he was outnumbered, he smartly cut inside as he waited for his onrushing teammates. The play found its way to Azhar Ramli (Singapore U15 #11) whose curled shot agonizingly hit the right post. However, Zulfadhmi was on hand to volley home the rebound to complete the sweet move himself. Heriul Suhanes recovered from his earlier mistake to make a couple of crucial saves, notably a one-on-one in the 20th minute, as the Cubs settled down. Newcastle, playing a direct style of football, made full use of their physicality and their two forwards always looked dangerous when given time and space. A prime example came in the 31st minute when Aarvin was careless and got caught out at the back by Alex Gillead (Newcastle U15 #9). Gillead selflessly squared it for Adam Armstrong (Newcastle U15 #10) who made it 2-1 for Newcastle. Singapore had more than their fair share of chances through Azhar Ramli but he couldn’t capitalize. Twice, he was put through one-on-one with the Newcastle keeper, and twice he missed. After the break, Singapore came out to dominate proceedings but the Geordies stood firm. Just after half-time, Ehvin Sahsidharan had a shot cannon off the crossbar following a smart, quick free kick. 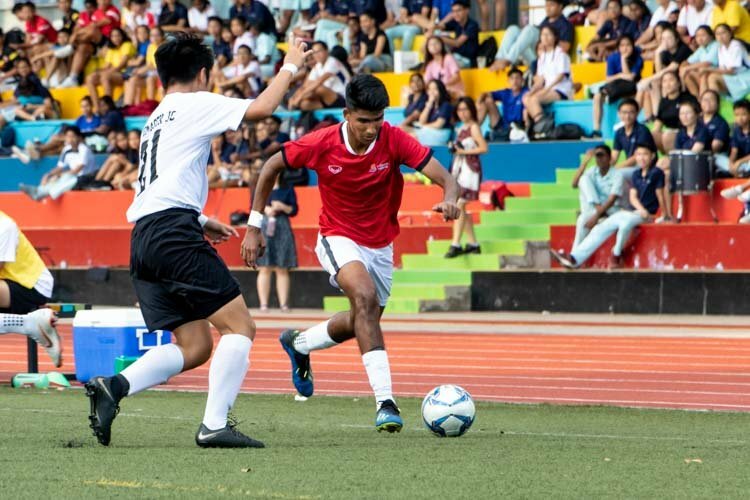 Singapore’s skipper Adam Swandi (Singapore U15 #10) also could not seem to break Newcastle’s resistance as he missed two chances in as many minutes. 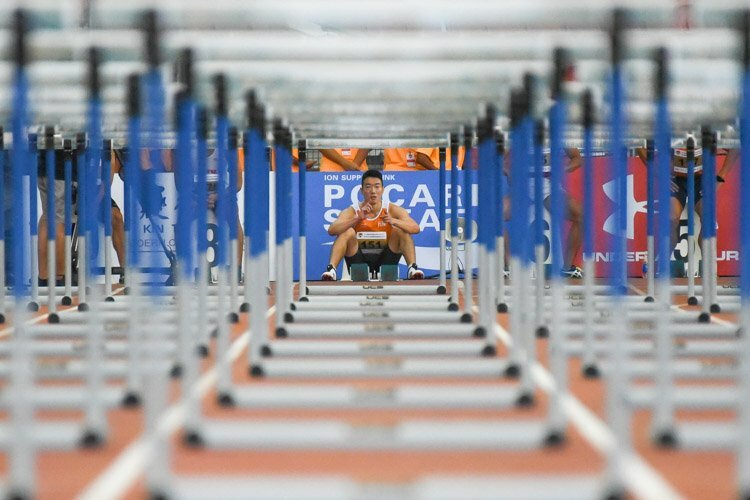 The Singapore captain was clearly frustrated. “I was very sad but I knew I should not give up and continue to motivate my teammates,” said Adam about his misses. Newcastle seemed to have done enough to win the match when they scored the third goal on a counter-attack. Daniel Barlasser (Newcastle U15 #16), a substitute, provided Gillead with a sweet through ball and the latter finished comfortably. In the 84th minute, Newcastle took off Gillead thinking that the game was theirs but the Cubs had not given up. 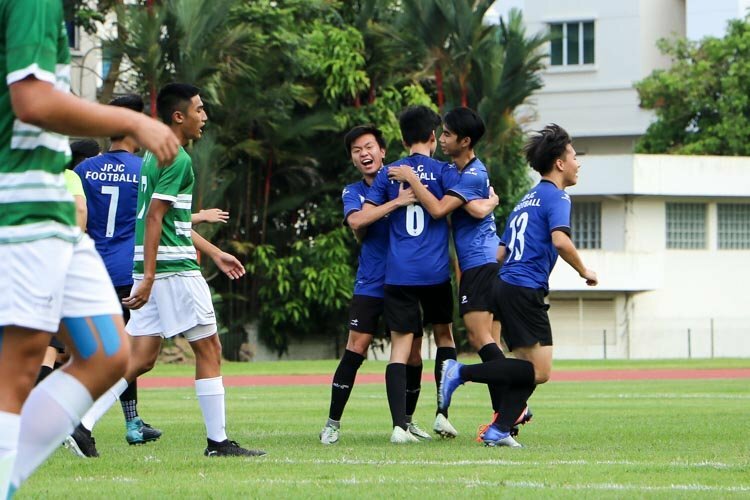 In the 86th minute, Singapore scored to make it 2-3 after a quick corner by Zulfadhmi allowed Adam to cross the ball towards the center for Azhar to convert. The boys saw a glimmer of hope and attacked relentlessly as Newcastle went through a defensive meltdown. A few minutes into stoppage time, Azhar Ramli did well to receive the ball from Ehvin on the right flank. 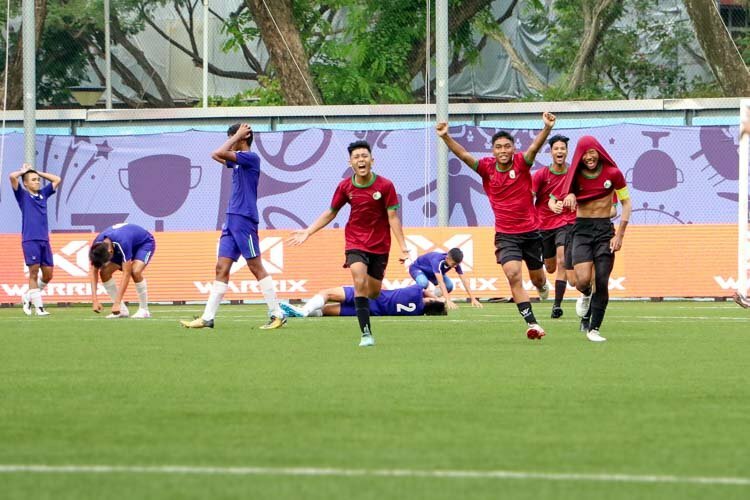 Ramli’s low cross cut through the mass of players to find Rifqi Yazid (Singapore U15 #13) and the second half substitute scored the equalizer. By now, the Newcastle players, used to only playing three periods of 25 minutes at a stretch, according to their coach Jimmy Nelson, were starting to have cramps as they struggled in the tropical climate. Sensing the shift in momentum, the home side bombarded the English goal with wave after wave of attacks. 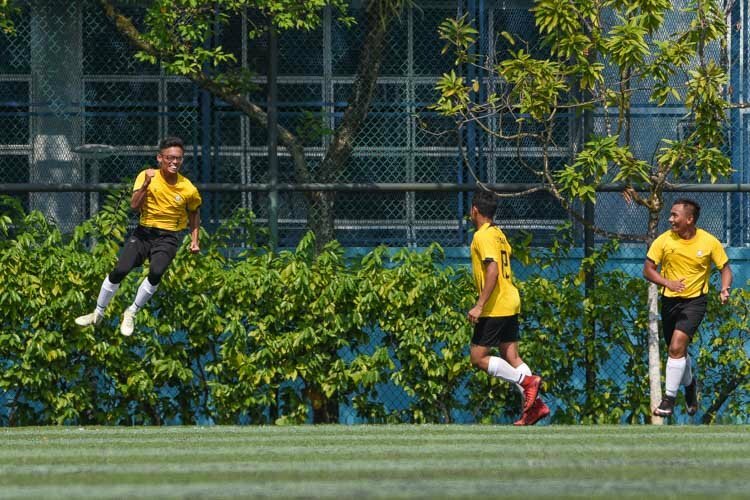 It finally paid off when a counter attack saw Adam play a perfect through ball for Faridzuan Faud (Singapore U15 #17) who rounded the goalkeeper to score the winner, prompting wild celebrations in the stands. Despite winning the Man of the Match award, Alex Gillead was clearly disappointed. “I am disappointed because we felt like we were controlling the match and we should have won it, but I am sure the guys will pick themselves up and get ready for the next game,” said Gillead. 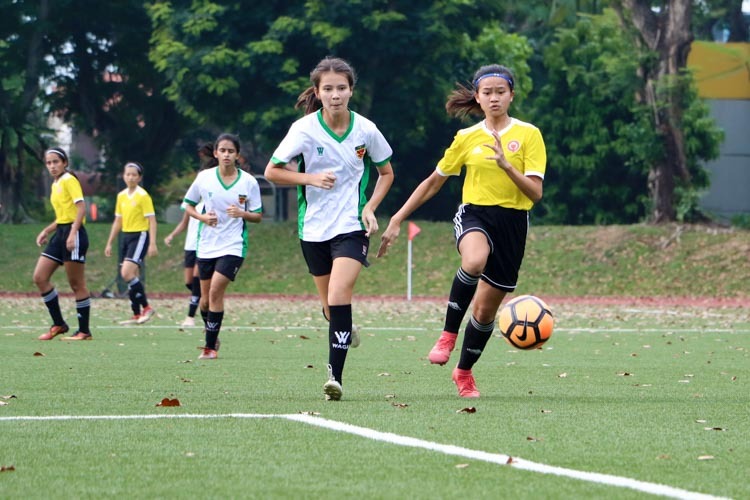 The Singaporean U15 team will next face Juventus FC U15 on Wednesday, June 22nd, while Newcastle FC U15 will play Juventus FC U15 on Monday, June 20th. In the other match, CR Flamengo U15 beat Everton FC U15 1-0. The technically gifted Brazillian side played a patient game throughout the match against a disciplined Everton side who defended stoically from the front. The only goal of the game finally came in the second half when Leandro Carvalho (CR Flamengo U15 #11) received the ball from Caio Rangel (CR Flamengo #10). 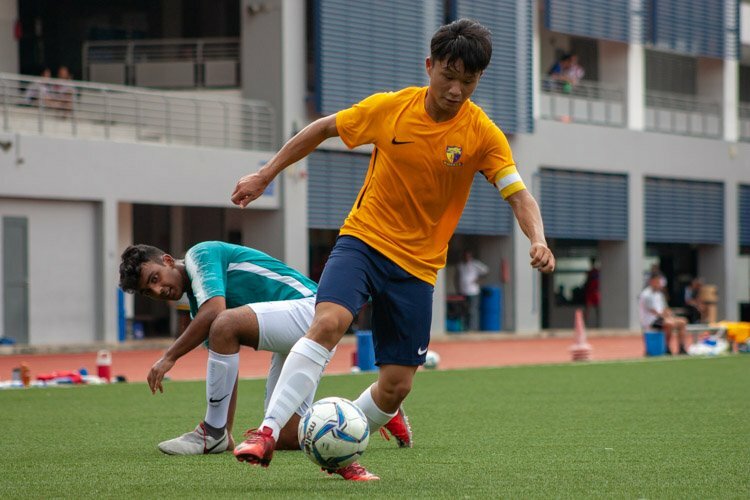 During the game, both sides were struggling with the hot and humid weather in Singapore. At one point, a throw in almost became an unofficial water break as both teams approached their respective benches to rehydrate and cool themselves down. The referee had to blow the whistle a few times to get the players to resume play again. really proud of our youth team! but at the same time, I think this really shows how overrated english teams are! the EPL may be the most famous in Asia here, but truth be told, it is only because of the way the league is marketed. The technical and tactical aspects are really lacking! or to be more accurate, completely missing, unlike the Spanish La Liga and Italian Serie A sides. so it comes as no surprise that Juventus and Flamengo were way better then Newcastle and Everton. i am not singaporean but i like singapore team and i wish they sucsess ,,, they need more and more training and they should stop waiting the ball ,, they should run and run to the ball and play hard not soft ..
note: i saw the first match and they win 4/3 after that i bought singapore flag and i put it on my flat but my singaporean wife lughe at me …. I feel proud to be singaporean again. I’m gonna dig out my Die Hard Fans T-Shirt from the M Cup days.